These automatic titrating burets feature Schott graduated borosilicate glass with blue ring graduations for accurate readings. Micro-screw control offers precise‚ convenient left- or right-hand operation. 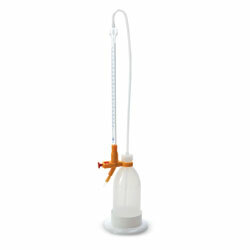 A sturdy stand supports the 1-L chemical-resistant low-density polyethylene (LDPE) bottle.